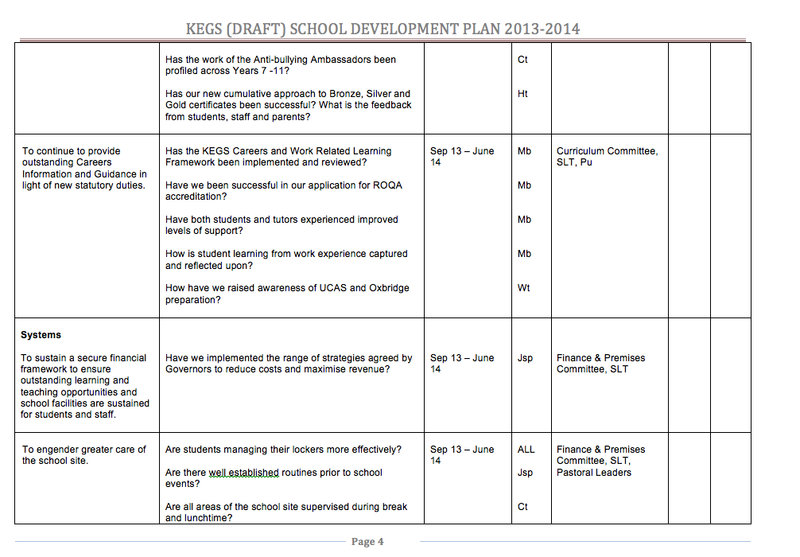 Writing a School Development Plan is a process most, if not all, schools engage in. 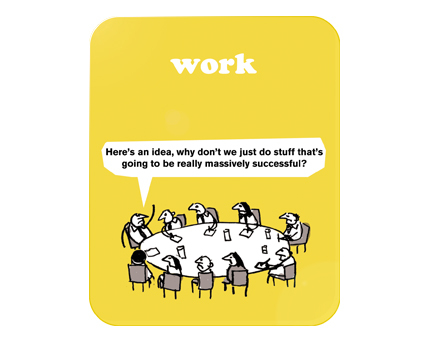 It might be an ‘improvement’ plan. 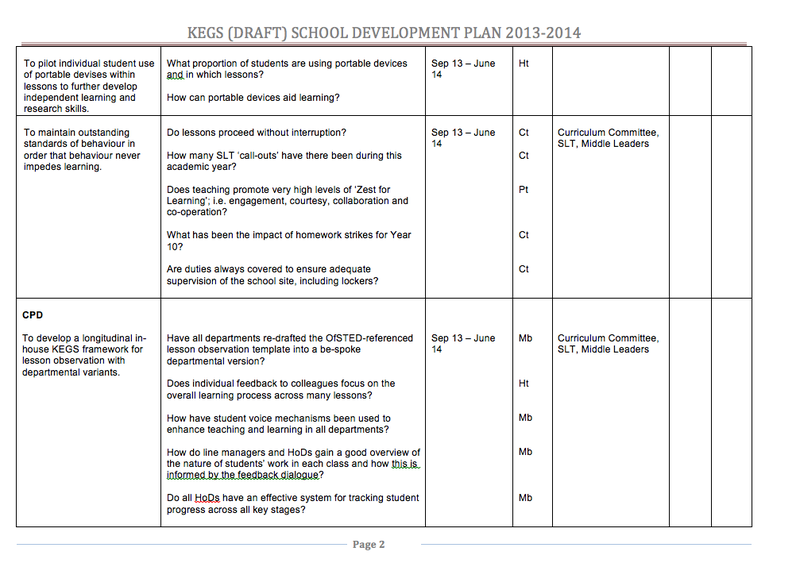 At KEGS we’ve been trying to develop the optimum model for our SDP so that it has maximum value in terms of helping us to take the school forward combined with a minimum of paper. Arriving at KEGS, I inherited an SDP process that I found cumbersome. It was a blow by blow account of everything going on… and I found that I never engaged with it – and nor did anyone else. However, there was one great feature: ‘the SDP in a nutshell’. This was a one page summary – the headline actions. I liked this a lot and had a copy enlarged on my wall for easy reference. We then took the decision to abandon the rest of the plan – and for two years we just had a nutshell – ie the whole SDP was reduced to one page. This was our ‘to do list’ and, because it was easy to engage with, we kept it live and everyone on the SLT knew what each line meant if we unpacked it. Similary, the rest of the school community could see what the general plans were. However, some new Governors joined our Governing Body last year and they said that they found it too difficult to know the detail. 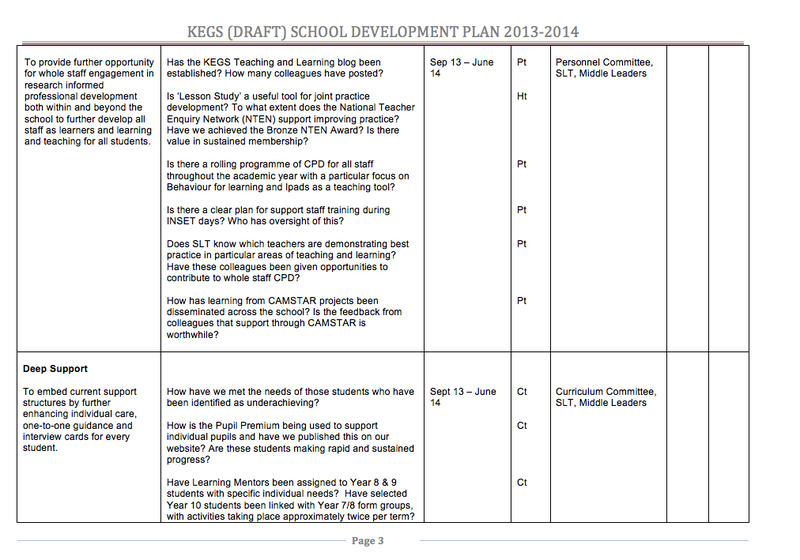 We recognised that the one-page SDP was only any use to the SLT where we could talk about the issues week in, week out. If we wanted Governors to engage, we needed to flesh it out and give them some sense of what we would consider a success. However, we felt strongly that we could waste a lot of time trying to define measurable success criteria. School improvement is a complex business; some outcomes are tangible and quantifiable; some are much less so. We found that if our success criteria were framed as questions, it helped us to evaluate progress. Each time we undertake a review, the questions shape the discussions and we can reference qualitative and quantitative evidence as we wish. We also introduced the simple Red-Amber-Green RAG system to communicate progress towards our objectives. Nice and simple. 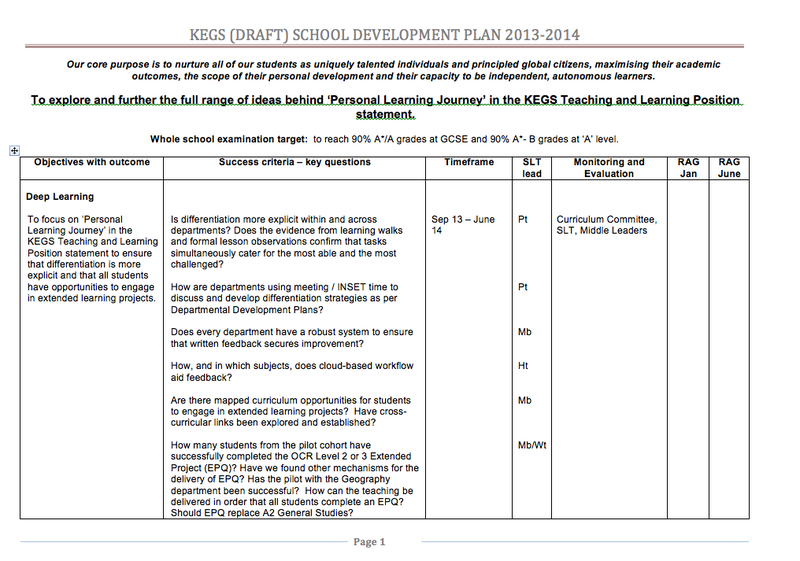 The document formatting pushes our plan out to 5 pages – but the core objectives are kept to a minimum. So -here it is. The KEGS SDP for 2013-2014. Note the re-statement of our core purpose at the very top. This is followed by a headline objective for the year. Last year it was ‘rigour and scholarship’. Next year it is ‘personal learning journey’. These are taken from our central teaching and learning position statement. There is then an over-arching data target which is very ambitious but sets the tone! There are always two overlapping cycles to work with. We are implementing one plan and reviewing it but always looking ahead to the next one. 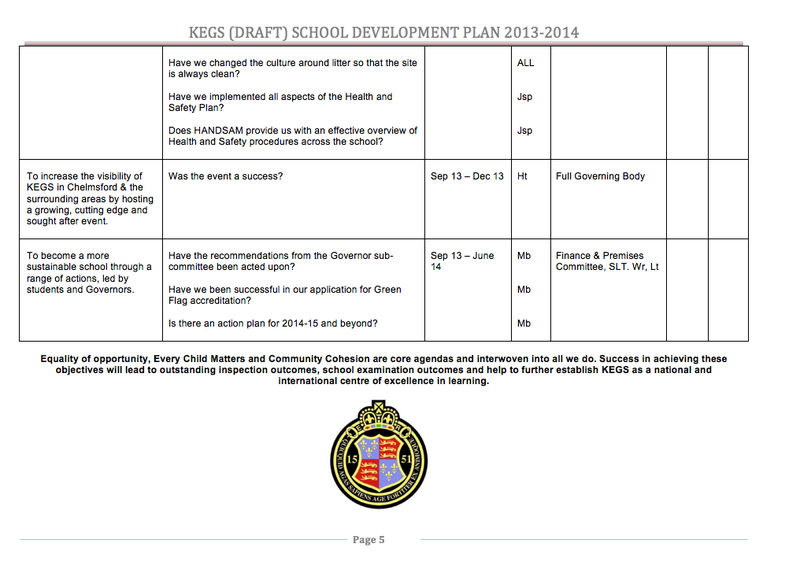 We use a range of processes to engage staff and Governors in shaping the plan so that the ideas contained within in link to the issues we are addressing. Most of the specific strategies have their origin in discussions with staff.. although the SLT has a key role in shaping and filtering… We’re endebted to Deputy Head Mark Barrow who is the chief architect of our SDP process and does the important job of communicating the content to all concerned. It works for us… it’s an ambitious plan in our context but one that helps us to achieve the goals. Thanks for sharing this Tom, seems a key document in terms of the micro-structure of educational improvement, as opposed to the national policy interest with macro-structures. Would be interested to know more about the careers and work related learning framework if it’s possible to share that with me.